"My Big Fat Diet" documentary about low-carb now on DVD! 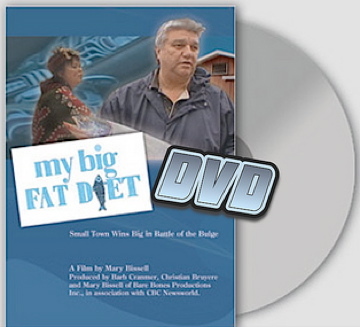 In March 2008, I blogged about a new Canadian documentary about a revolutionary documentary featuring a whole community of Canadian Namgis First Nation people who went on a traditional high-fat, low-carb diet to see if that would help curb the trend towards obesity and disease that has afflicted them in recent years. It was an innovative and ingenious experiment to determine if the modern Western influence on their diet was responsible for their decline in health. Did it work? Uh, DUH! The results of this remarkable study were unbelievable in light of all the continued negativity about low-carb living that STILL occurs in the media and from so-called health "experts" in 2008. Led by Dr. Jay Wortman, along with assistance from some of the most prominent low-carb researchers and genuine low-carb experts in the world (Dr. Eric Westman, Dr. Mary C. Vernon, Dr. Stephen Phinney, Jackie Eberstein, etc. ), the lives of these people experienced quite a turnaround thanks mostly to the healthy low-carb lifestyle they now enjoy which was the original diet of their early ancestors. Up until now, people in the United States have been unable to see this surprisingly funny documentary because it has neither been shown on television here nor has it been made available for purchase on DVD. But after Mystique Films received tons of public demand since it aired in Canada, the filmmakers have finally decided the time was right to release this groundbreaking documentary about the Canadian high-fat, low-carb diet study to the masses. And you're hearing about it first here today at my blog! Be one of the first people in your area to own a copy of My Big, Fat Diet by clicking here. You can purchase an Individual View version of the DVD (which means for your personal use inside your home) or the Public View version of the DVD (for larger audiences in a group setting) by using PayPal. You can purchase this DVD by using your Visa, Mastercard, Discover, American Express, or PayPal account and the price includes your shipping and handling charges. I cannot think of a better gift for someone you love and care about who needs to hear about how low-carb has changed the lives of real people. I've been inundated with e-mails from so many readers who have been waiting for this DVD to arrive. Well now it's here, so let's show Mystique Films how much we appreciate all their hard work in bringing this pro-low-carb documentary to us. ORDER TODAY and get extra copies for your doctor, your friends and family with weight and health issues, and anyone else who could stand to benefit from livin' la vida low-carb. Special THANKS to Dr. Jay Wortman for conducting this study and to My Big, Fat Diet producer Mary Bissell who was at first skeptical about a high-fat, low-carb diet but became thoroughly convinced after she saw the changes happening to them right before her very own eyes. That's the power of this message of a healthy low-carb diet and I can't wait to hear what you think about this DVD! We were able to download (legally) the program on which My Big Fat Diet originally aired. This documentary is amazing! It FINALLY convinced my husband that this way of eating is the way to go. Dr. Wortman rocks. I am so happy they released it finally. I have watched my copy several times and it's really making me rethink HOW I life low carb in reference to eating closer to how my ancestors ate. I am so thankful to the director for producing such an even handed show and Jimmy for telling us all about this program. All of our ancestors ate and drank this way. -- Very close to the same way all of the other species ate and drank, they in turn lived in perfect health and lived to be a very old age, just like them. -- The whole world ate what was natural to them in there local area. -- We ate and drank water and indigenous wild animals and birds and fish and plants and bugs and seafood. -- Very low carbohydrate and very low starch and nothing more. Hybrid plants didn't exist! Carbohydrate addiction didn't exist! -- Mental disease didn't exist! -- Dr. Wortman is accomplishing what no other man could have done in bringing this forward. It's as natural to these native people as they are themselves to the land! We will all benefit immensely from these studies. What is the difference between the public view and the private view DVD, other than price???? The group price is for public performance rights, which means: giving the right to organizations to show the DVD on an ongoing basis to groups, or to use the DVD as a library item.